Hedda Gabbler (1891) is one of Ibsen's best regarded plays, set in Oslo. The lead character is considered one of the great dramatic roles, and the play is a classic of 19th century realism. "Gabler" is Hedda's maiden name because her personality is more aligned as her father's daughter than as her husband's wife, according to Ibsen. As stated in its introduction, Hedda Gabler is the most detached and objective of all of Ibsen's plays. Translated by Edmund Gosse and William Archer. 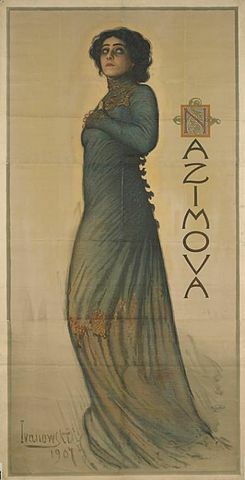 Illustration is the poster of Alla Nazimova as Hedda Gabler (1907). Return to the Henrik Ibsen library.